Before you head out the door, regardless of what time of day you’re leaving, give yourself substantial time to eat a well-balanced meal to help stave off hunger and avoid bad choices later on in the day. What does a well-balanced meal entail? The U.S. Department of Agriculture’s MyPlate (which replaces the Food Pyramid), offers general guidelines for Americans two years of age and older. MyPlate suggests that half of your plate should be comprised of fruits and vegetables, followed by whole grains, low fat dairy and lean proteins. Packing healthy snacks ahead of time is time well spent before your trip. TSA’s airport security rules prohibit passengers from taking liquids in excess of 3.4 ounces (but you can bring an empty water bottle and refill it later – many airports have water fountains and water bottle filling stations), but healthy snacks in your carry-on like apples, dried fruit, nuts, carrot sticks and protein bars should pass through security with no problem. If you’re really ambitious, you could even consider packing sandwiches that don’t easily spoil. Grab some nut butter and slap it between two slices of 100% whole grain bread or try a low-sodium turkey breast (nitrite-free is always a great choice) on whole grain bread with your favorite mustard. 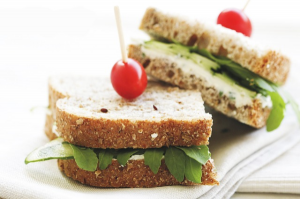 Tip: adding mustard, hummus or low-fat mayo in between turkey slices will prevent soggy bread. Yes, you’re actually reading this correctly – not all airport food is bad. In fact, airport terminals are ramping up healthy offerings and ditching mundane choices in favor of high-end fresh and even organic selections. For example, Starbucks sells a “protein box,” which comes with a hardboiled egg, nut butter and fresh fruit. Even fast food chains like McDonalds offer healthier options like grilled chicken salads and fresh fruit with yogurt dipping sauce. Every year the Physicians Committee for Responsible Medicine (PCRM) reviews the food served at the country’s busiest airports. After examining airports in major cities such as Atlanta, Chicago, Denver, Los Angeles, Orlando, San Francisco, and Washington, D.C., PCRM dieticians found that 76% of airport restaurants now offer at least one low-fat, high-fiber, cholesterol-free vegetarian entrée. In other words, when you’re at the airport, “there are no healthy food choices available to me” just doesn’t fly these days – no pun intended. Whatever you do, don’t bet your life on finding a healthy meal option on board. If you don’t want to bring food on the plane from home or from the terminal, and you’re on a flight that will be serving meals, call the airline ahead of time. Most airlines will accommodate your health needs by offering meals that are low-fat, vegetarian, gluten-free, low sodium, etc. DietDetective.com publishes an Annual Airline Snacking and Onboard Food Service Survey which compares and ranks the snacks and onboard food-service offerings from major airlines. Overall, the snack boxes and meals are getting stronger and moving in the right direction, but there is still room for improvement. In 2012, Virgin American and Air Canada topped the list, along with Alaska Airlines. The “Shame on You” awards went to Frontier and Allegiant Airlines. It is important to stay hydrated while traveling, especially when flying – most people feel most comfortable when humidity is around 50%, but air in an airline cabin can fall to as low as 1% on long flights. Water and 100% fruit juices (limit these beverages to 8 ounces since they tend to be high in calories) and decaffinated herbal teas are your best bet since research suggests that caffeinated beverages actually have a dehydrating affect. Dehydration can lead to headaches, muscle cramps, fatigue, and reduced concentration. Hint: If you are prone to upset stomachs or nausea, bring along a few herbal tea bags such as ginger or chamomile. Don’t forget if you’re traveling to a developing country, to check with your travel assistance provider or the CDC’s website for the latest information on how safe the food and drinking water is at your destination.